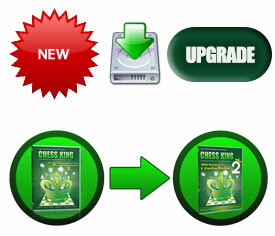 Upgrade from Chess King 1 to Chess King 2 with Houdini 2 Download (new June 2013) FREE! Upgrade from Chess King 1 to Chess King 2 With Houdini 2 Download [June 2013] FREE! Chess King 2 with Houdini 2 is the new June 2013 version of the top selling Chess King chess software that was introduced at the end of 2011. Chess King 2 is now as easy-to-use and as powerful than ever, includes more games and puzzles, and is powered by the super grandmaster engine Houdini 2. If you have Chess King 1, it is very worthwhile to upgrade. You get a new updated and improved interface with more functions, more games up to April 2013, as well as full compatibility with Windows 8 and a choices of interface in 5 languages. Note: you will need your original Chess King 1 serial number for this upgrade to work. AVAILABLE TODAY AND FREE. The order will not formally go through since the price is 0 (zero), so simply email us to support@chess-king.com and you will get an email with all links and instructions within 1-3 hours, no later than within 24 hours. Chess King 2 is a new and versatile tool for chess players and is an ideal introduction for the beginner, a challenging opponent for the practiced amateur, and an invaluable coach for the aspiring master. Chess King emphasizes simplicity of use in training players. However, it is more than just a traditional training program as it includes an extremely strong chess engine and a huge professional database. It is also a convenient tool for analyzing and studying one's opponent before facing them at a tournament. Buying Chess King 2 is like getting several products and paying only for one, a professional chess software system, the largest game database available GigaKing, the super grandmaster chess engine Houdini 2, 1500 chess puzzles for all chess levels, a unique random playing mode, and much, much more. Included: Houdini 2, GigaKing Database, Full opening tree, Chess puzzles, over one hundred opening positions, Photos of over 1600 chess players. Houdini 2 - a chess engine rated well above 3000 Elo is an excellent choice for analysis. Considering such a strong engine can be frustrating to play against, Houdini 2 includes various kinds of handicaps that can be set up using the Chess King interface. The version of Houdini 2 that comes with Chess King is a single processor one. GigaKing Database contains over five million chess games. This database includes games from the 16th century up to April 2013. Full opening tree is a statistics database of positions in the GigaKing database. The program is very easy to use, with over 20 video tutorials available on the publisher''''s site and a possibility to send questions and feedback to the manufacturers. More features than programs costing many times more. For a full description, see the tab SOFTWARE.